Pond UV Truths; Sterilizer, Clarifiers . Pond UV Sterilizers vs. Aquarium UV Sterilizers; is there a difference? 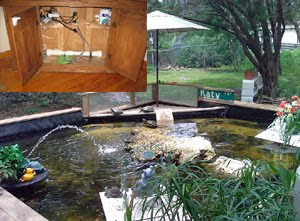 This said I have had persons over the years tell me that a store (or web site) stated that a UV sterilizer that is made for a pond is even better for an aquarium; the truth is this is generally false, however for clarification, please read on! *Heavy duty construction so as to withstand the sun light and other elements. However any UV that is even indirectly protected form the elements (sun light, heavy rain or snow) will work fine for a pond, assuming otherwise good construction. This is probably the most important aspect of a pond UV Sterilizer in that most ponds have higher amounts of organics in the water as well as general debris that will both clog a UV Sterilizer and significantly block UV effectiveness. However even most of the UV Sterilizers specifically designed for ponds have no more ability to carry out this function than other UV Sterilizers. This function must be added by way of a pre-filter or standard pond filter by which the water passes through before the UV Sterilizer. It should be noted that some pond UV Sterilizers come with bulb/sleeve “wipers”, but these gimmicks do not keep the quartz sleeve much cleaner than simply one without. These wipers fail to remove hard water deposits well, which is the most common problem of UVC light blocking build-up on quartz sleeves. In truth, units with direct contact of water (such as the Custom 15 Watt UV Sterilizer or some Aquanetics models) actually clear many ponds in the summer just as effectively and are less fragile. As an example, had a customer go through two Tetra UV Sterilizers until trying out the "custom UV" that I built, which performed much better (he lives in the warm summer climate of the Central Valley of California). I should note that the design of my custom UV is similar to the TMC Advantage/Vecton line of Premium UV Sterilizers, minus the quartz sleeve. *For algae control an average UV Sterilizer (some need slower flow rates due to poor design) require a flow rate of 40 -60 gph PER watt. 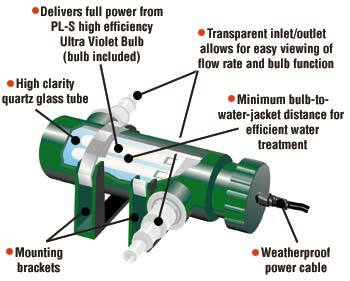 The compact UVs generally require a slower flow rate of 40-45 while the straight tube UVs can have higher flow rates of 45-60, with the TMC Advantage & Vecton UV Clarifier working well at flow rates of 60 gph per watt (or even higher) due to the exceptional flow design (dwell time). * For bacterial control (Level One Sterilization) an average UV Sterilizer needs a flow rate of 20-30 gph PER watt (some need slower flow rates due to poor design, while others such as the TMC can get by with the higher flows of 35 watts per gph). * For parasite control an average UV Sterilizer (some need slower flow rates due to poor design) needs a flow rate of 8-12 gph PER watt (generally almost ALL UV Sterilizers work to control parasites more by indirect means such as improved water conditions such as Redox and lower suspended bacterial counts). How do they get a jump of almost triple flow for less than double wattage increase? Second the flow rate claims for both are outrageous for both algae and bacterial control. 900 gph calculates out to 100 gph per watt which is ridiculous, so someone who purchases this for a pond or aquarium thinking this will do a better job due to high flow rate claims are sadly mistaken. The bottom line is do not buy a UV Sterilizer such as the one listed above for your aquarium or pond under the mistaken belief that it can handle more since it is called a pond UV. This is neither true for aquariums nor ponds. This is also not to say that the above pond UV Sterilizer does not work, however it should not be purchased based on its claim of flow or simply because it is a "Pond" UV Sterilizer as that makes little difference in real world application. 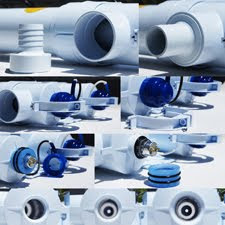 If you are truly interested in high end UV Sterilizer for your aquarium that is primarily designed for ponds, consider a Pond UV Sterilizer with a high output (HO) UVC Bulb and longer exposure time based on a longer bulb (or quartz sleeve) and water contact via a UV with a design that utilizes this aspect of design. A good example would be the TMC Pond Advantage 15, 25, 30, & 110 Watt UV Sterilizers or the Aqua HO UV Sterilizers (although the Aqua units generally cost much more with no more dwell/contact time as compared to the TMC units). In fact for larger ponds, you will not find a better UV Sterilizer/Clarifier in design, flow rate, durability, ease of obtaining replacement parts (which is where even many of the better UV Sterilizers fail), & over all effectiveness than the TMC line of UVs, which have long been recognized as a leader in Europe. The picture above shows a breakdown of the TMC 110 Watt UV Sterilizer, Clarifier which is without equal for larger ponds (or even central aquarium systems), especially when price is considered.